If you followed competitive figure skating before 1995, your first glimpse of new programs and new senior level skaters was likely when you tuned in to the U.S. championships in January. While the first World Championships were held in 1896 (a men’s event only), the Grand Prix series is a relatively new addition to events sanctioned by the International Skating Union. Initially launched in the fall of 1995 as the ISU Champions Series, it became known as the ISU Grand Prix of Figure Skating starting with the 1998-99 season. Yes, skating federations of several countries hosted fall international competitions (the first Skate America was held in 1979) but much of the television coverage of the era was committed to other sports then the emerging made-for-TV professional skating programs. Early feedback from international judges – With feedback early in the season, skaters and coaches digest the scores and make adjustments prior to their national championships and Worlds. The series also allows skaters to check out their competitors. Yuzuru Hanyu definitely put the men on notice with his gold medal performance at the NHK Trophy, setting world records for his short, free and combined scores. At the Grand Prix Final in Barcelona, Hanyu broke his own world records on the way to becoming the first man to win three straight gold medals. Skaters can settle into their new or upgraded programs – By the time skaters get to the major events, they have multiple opportunities to run their programs in competitive conditions. Fans benefit by witnessing the evolution of programs and the growth of skaters as the series unfolds. International exposure – With skaters going to a maximum of two grand prix events, skaters have an opportunity to gain international exposure and experience. Prior to the introduction of the series, a small number of skaters from each country had the chance to compete internationally each season. With ISU’s creation of the Junior Grand Prix series in 1997-98, season, fans have been given the benefit of getting to know the up and coming skaters before they reach the senior Grand Prix series. attend four Grand Prix events (Skate America twice, Skate Canada and the Grand Prix Final). Despite the growing popularity of these events, skaters remain very accessible during the events. I am still in awe when I am strolling around the rink and international skating stars walk among us. While I am careful not to be intrusive, they are very kind when I ask for a quick pic. This is one of my favorites from Skate America 2015 with Mariah Bell. (She’s one to watch, by the way). Increased buzz for the sport – By linking the events to create a running competition through the fall, a new event was added (the Final) but perhaps more importantly, it sparked a new level of fan interest. 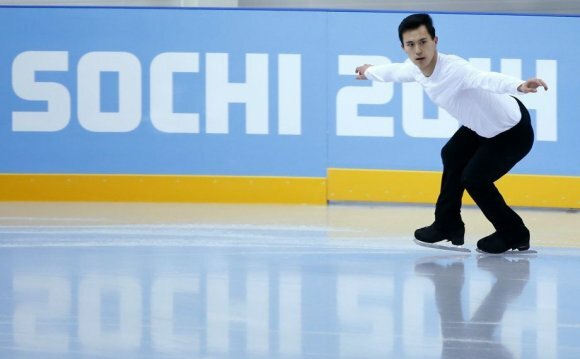 An early season championship event let fans see who might emerge as the top skaters heading into the World Championships? When I reflect on the explosion of competitive figure skating since the late 1990s (and its fan interest), I can only imagine the delight of the visionaries who created the Grand Prix Series. It was a game changer for the sport.